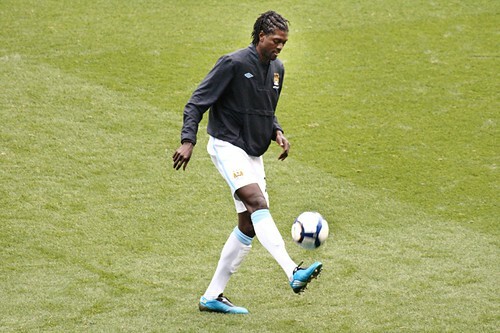 Manchester City has confirmed that Emmanuel Adebayor may be ready to return to the club in time for their Carling Cup leg against United. Someone like Adebayor doesn’t need to “get in shape” for a return to the Premier League, but he is a guy who needs to be mentally ready to play again. Since he is formerly an Arsenal player it’s hard enough to see Arsenal shoot to the top of the Premier League table, but it’s got to be even harder to play again after what happened to his Togo National Team. After a rampaging gunman shoots up your team bus you may not be “in the mood” to play in a stadium packed with people you don’t know, but you’ve got to start somewhere. Roberto Mancini say that he has some tired players who need a rest, but is Ade really the person to “give someone a rest”. Expectation and underestimation kill sports teams and this situation could be no different. The level of expectation that I hear coming from Mancini is a big “red flag” for me. True, they may go into Old Trafford and beat the hell out of United, but it can’t last. There are no guarantees for any player who returning from a long absence. A mixture of Tevez and Ade or de Jong and Ade would be good. Get Ade out there with someone who’s been “in the flow” these past few weeks, and let him ease his way back in. United probably wins the day, but City will lose the season if the throw Ade out there and he isn’t ready to “save” them.